After taking part in the event in 2015, everyone at work decided to participate in wear it pink again in 2016. But this time we wanted it to be different. We sadly lost our dear friend and colleague, Susan Spring, to breast cancer in September 2016 and decided that this time we would honour the memory of our much loved team member. We wanted to raise money in the hope that one day no woman will have to deal with what Susan experienced. It was also a perfect opportunity to bring the office together to commemorate her life. Not only does it represent a worthy cause but it is a really lovely way to have fun at work. The one day event happens every year in October during Breast Cancer Awareness month, a worldwide annual campaign highlighting the importance of breast awareness, education and research. Here at Expect Distributions Ltd, we decided that as well as raising money for wear it pink we would also plant a tree for Susan in our Bradford site. If ever we missed her at work or needed a quiet moment, we could go and sit by Susan’s Memorial Tree. So our annual fundraising for wear it pink would be split between Breast Cancer Now and a memento that will last for years to come. The day itself was a huge success. I would like to say a big thank you to everyone at Expect for getting involved and a special thank you to our suppliers, Versant and TES MacDonald. Calling on other colleagues and suppliers was so helpful. TES MacDonald kindly donated balloons, sweets and created the ‘Expect the Pink Wig’ challenge. 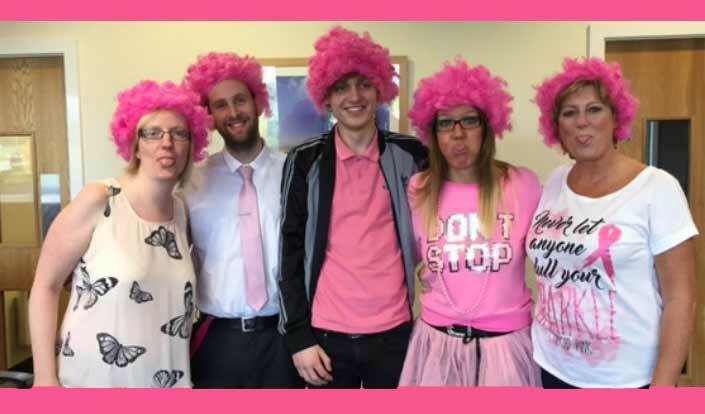 Versant UK donated £25 towards our wear it pink day, which was amazing. As well as having a pink non-uniform day for office staff with a minimum donation of £2, we held a pink cake sale and a pink sweet stall where we sold tons of delicious treats. I’m so excited to announce that our grand total was £464, doubling the amount we raised in 2015! This is such an amazing achievement, and I’m so proud that we pulled off such a great day, while also honouring the memory of a friend by planting the tree.